The upper trough over north-central Europe moves further east where a strong short-wave moves along the southern flank jet stream. A ridge strengtens over SSW Europe. 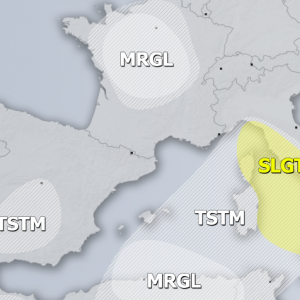 ENH/SLGT risk have been issued for most of central Europe and into NE France, Benelux, N Germany, N Poland, W Belarus and W Ukraine and Romania where rather widespread threat for organized severe storms exists. Within the strong WNW jet streak above, a short-wave upper trough rapidly moves from Benelux towards Poland and provides large scale ascent for convective development along the leading surface frontal boundary. Moderately strong deep-layer shear (40-50 knots) and marginal SR helicity ahead of the front will be favorable for rotating storms, but rather limited instability and weak capping should preclude widespread severe storms, so more discete severe cells are likely. Main threat with these storms will be large hail, heavy rainfall and severe winds. However, some potential for tornado threat exists from NE France into Benelux and W Germany where enhanced SR helicity is present due to better low-level wind profiles, despite the limited CAPE. Storms should merge into a large cluster or two in the late afternoon hours and continue into the evening while moving into Slovakia and Hungary. Damaging severe winds will be the primary threat with these clusters. An ENH risk has been issued for north-central Ukraine into W Russia with threat for severe winds, large to very large hail and torrential rainfall. A surface front associated with NE-wards progression of short-wave trough will serve as a focus for storm initiation by early afternoon. With relatively strong instability in place (MLCAPE locally above 1500 J/kg), rapid storm development in expected, which should organize into intense multicells and some supercell storms given the moderate shear and helicity available. With the near parallel front against the shear vectors, more linear mode of storms / clusters is likely, including bowing segments with severe damaging winds threat. 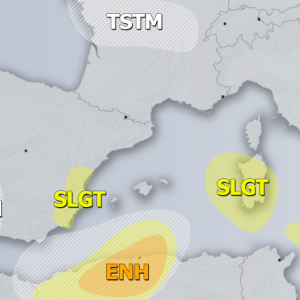 A SLGT risk has been issued for areas surrounding the ENH risk across E Romania, Moldova, central Ukraine, E Belarus and W Russia into SE Finland with more isolated threat than across the ENH area but still some severe threat exists. Higher potential for mode coverage of severe weather seems from W Russia into SE Finland where an excessive rainfall is likely near the front closer the surface low. 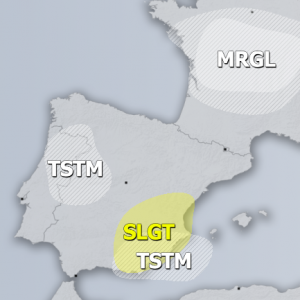 However, weak to moderate CAPE should support some marginal hail and strong to severe winds within the SLGT risk area. A MRGL risk has been issued for north-central Sweden into N Finland with threat for isolated severe storms, capable of producing marginal hail and strong winds. Storm will be diurnal driven only.